If you live in Australia, you know all about the special deals that car dealers offer at the end of the financial year (EOFY); and if you were in the market for a new car like me, June would have been your most expensive month! 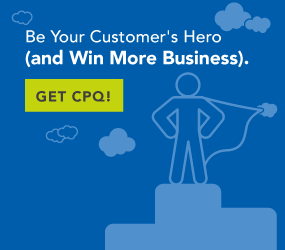 CPQ is a game-changer when it comes to empowering consumers to personalise a product, services or bundles of the two. After your home, the family car is most likely your biggest financial commitment, no matter how you finance that purchase. So picking the best vehicle that meets your needs and budget as well as factoring in the cost of ownership for the long term and the resale value is a significant undertaking. Buying a new car is also an emotional decision that involves more complex feelings such as status symbols, pre-conceived ideas, likes and dislikes – some acquired over many years as well as inherited from our parents – and, of course, options from family and friends. Who would have thought that buying a vehicle for getting us from point A to point B (mostly from home to work and back) could be so complex! The challenge doesn’t stop there. Gone are the days of the Ford Model T’s “any colour as long as it’s black;” this is the era of mass-personalisation. Personalising your new car is also more than just picking the colour. Car manufacturers, like vendors in most industries, are well aware of the price-conscious buyers, so several features have been made optional. These features are not just cosmetic ones either; they range from engine or wheel sizes to safety features, sun/moon roofs, leather seats, etc. Knowing that we start doing our homework online to help us with that decision, car manufacturers have invested in websites with a highly visual and graphical interface to help us in our selection process. We can even now get an online quote/estimate for the on-the-road cost as well as the mandatory call to action: book a test drive from the nearest dealer. Being the detailed and analytical person that I am, I was determined that my decision process was going to be an educated one, and any influences and opinions from my father and friends could be debated using documented hard facts and solid information. My first approach was quite similar to what I would do to select an insurance product: I looked for comparison sites to compare different makes and model features side by side. I was a bit disappointed by what I found, which was generally a clunky user interface and a lack of selection criteria. In other words, you need to know the makes, models and grades of cars you want to compare. The problem is, there are so many different cars! How do I come up with a short list? That left me having to go through several manufacturers’ websites. I ended up making a short list of car manufacturers based on conversations with my mechanic, my father, friends and by simply looking at what I see on the road that “looked nice.” It wasn’t quite the start that I was expecting to have, but nonetheless, I had my short list of six car manufacturers. However, things got a bit more complicated when I had to identify the actual models and grade(s) that could potentially fit the bill. Ultimately, I had to extract the information that was relevant to me and manually enter it into a spreadsheet so I could compare. One advantage of that tedious method was that I was also able to add other valuable information from other sources such as the cost of comprehensive insurance, registration and maintenance cost to get a feel for ongoing running costs. At the end of the day, I ended up with two tabs – one that compared the shortlist of six different cars on a minimum set of key criteria then a detailed tab to compare the top two. What I found interesting was how each manufacturer allows consumers such as me to identify their ideal car. This is where things also started to get complicated and frustrating since some options are not available across all base models or grades. Car manufacturers have created a hierarchy that goes something like: Make à Model à Grade à Car. So to start with, I had to pick the right grade to get exposed to the features that I wanted. That sometimes caused problems, because I wouldn’t always know what the features would be until I had made that grade selection, and backtracking to select another grade often meant starting from scratch (sigh). Another point of frustration was when I tried to compare side by side two different grades from the same model. One manufacturer had a convoluted method that required me to select a totally different model in which I had no interest, and then replace it with the one I wanted (sigh again). None seemed to offer the ability to save my configuration so that I could return to it at a later date. This meant that I had to reconfigure vehicles dozens of times over and over again, which is an expensive purchase since a decision wasn’t going to be made in just a few clicks! Lastly, what was also disappointing was that my online requests for booking a test drive fell into black holes. There were either no or very late follow-ups, and they were totally disconnected from my actual visits to showrooms. First, you’re doing great work with the visual appeal of your websites – the embedded videos and images look awesome. However, remember that we consumers are channel hoppers; we sometimes start on a PC/laptop, but we also use tablets, smart phones and different browsers too. So it needs to work and be responsive across all of those platforms. Then, of course, we are going to visit the dealer and go for a test drive. If I book a test drive online, I should get a call back within 24 hours at the most, and when I visit the dealer, they should know already who I am and what I want to test drive. When it comes to configuration, given the growing number of options and variations, whatever technology you are using now isn’t cutting the mustard … sorry. It started well and gave me the expectation that I could “build my car” easily, but it failed very quickly. Your “configurator” didn’t allow me to start the selection process where I wanted with the features that matter to me. There wasn’t even the option to rank some feature categories such as safety or fuel consumption to narrow down the choices, and it didn’t allow me to go back and forth as I changed my mind or changed priorities (and I do that a lot). I didn’t get any guidance in the process, and the fact that after spending a few minutes configuring my car, there was no option to save it was also disengaging. The good news is, there is affordable technology that does all of the above and more; it’s called Configure-Price-Quote (CPQ), and the best ones are integrated into your CRM. CPQ is a game-changer when it comes to empowering consumers to personalise a product, services or bundles of the two. How do I know that? Because I happen to work for one of the leading CPQ vendors on the market. And for those who are wondering what car I ended up buying, I got the Mazda 6. It came out on top of my selection criteria and even has a bonus “zoom zoom” button!